Just search for EcoClean Austin in your app store to take advantage of on-demand cleaning using our cleaner app, today! You can receive real-time automated text notifications when your items are picked-up and when they are delivered. If you are a store customer you can receive text notifications when your items are ready at the store. There's never been an easier way to keep track of a dry cleaning pick up service! To receive text notifications either change your communication preferences by logging into your customer portal or by calling us at (512) 236.8645. Or just tell our counter staff the next time you visit an EcoClean location. We strive to provide the best customer service out of all of the dry cleaners in Austin! EcoClean is proud to offer free pickup and delivery throughout the Austin area. No more searching for "dry cleaners near me"! 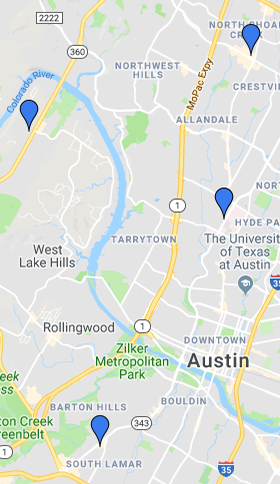 Only a handful of dry cleaners in Austin are in the dry cleaning pickup and delivery service business and we are one of them. Our dry cleaners delivery service is completely FREE! You pay the same price you would at any of our four Austin area locations. People will often tell us "there is no dry cleaner near me or laundry service near me, when are you opening a cleaner near me?" While we are expanding as quickly as we can, we also recommend customers strongly consider signing up for our dry cleaning pickup and delivery service. Having your clothes picked up and dropped off at your home is even better than having a dry cleaner nearby. EcoClean would love to be your Austin, TX door to door cleaners! Pick-ups are available Monday through Friday. Deliveries are made two business days after we receive them. We offer the best delivery in Austin! You can set your account for an automatic laundry pick-up from your home or office each week or you can email, call or text us on those weeks when you have a pick-up. We know that sometimes you can't wait two days so we try to accommodate rush dry cleaning delivery service when we can. Just ask for expedited service when you schedule your free dry cleaning pickup and delivery. Dry cleaning Austin TX style means having someone else brave the heat so you don’t have to. Our dry cleaning pickup and delivery service is more convenient than having cleaners nearby. Scheduling: Please schedule your pick-up by 9:00 a.m. or call on a prior day. Minimum Order: A minimum of 3 “wet cleaning” items is required for a pick-up. 2 laundered shirts or pants are equivalent to 1 “wet cleaned” item. Bad Weather: If the Austin area is experiencing bad weather (snow, ice, very strong winds) on the day of your delivery, we will delay the delivery or pick-up of your order until the next delivery or pick-up day to ensure our driver and your clothes are safe. We value our reputation as a responsible cleaning services in Austin, TX. Holidays: We are closed on the following holidays: Memorial Day, 4th of July, Labor Day, Thanksgiving, Christmas & New Year’s Day. If your pick-up/delivery day falls on a holiday, your order will be picked-up/delivered on your following day. Stains & Special Attention: We inspect every garment as it comes in and easily catch most stains. If you would like to call our attention to a particular issue, please include a note with your order with specific instructions or feel free to call us. Stop dry cleaning Austin. To get out the worst stains, you need wet cleaning. Garments: We are unable to clean leather, fur, vintage items, damaged fabrics or items colored with unset dyes (Indian silks, Guatemalan cotton, etc.). In the event that we receive an item that cannot be cleaned, we will return the item at no charge. Services: We offer full wet cleaning, Austin laundry services, and wash & fold in Austin to our delivery customers. Repair & Alteration: We are now offering alterations in Austin, TX! New to Delivery? Check out whether you are in one of our service areas and stop wonder if there are any "dry cleaners near me"!